Quezon City – Although football (known as soccer in the United States) is hugely popular worldwide, the Philippines has preferred basketball since the start of the 20th century. After the last FIFA World Cup in 2010, however, the sport has finally caught the interest of Filipinos. In fact, the current football fever is so high that several prestigious football clubs, such as Barcelona and Real Madrid, have organized clinics in the country to train young children. Meanwhile, Philip and James Younghusband, both members of the Philippine national team, put up the Chelsea Soccer School in May 2012. The brothers are of Filipino and British parentage. Football has a long history in the Philippines, introduced by British sailors and sportsmen, who later formed part of the Manila Club. Competition was cut short during the Battle of Manila in 1898; renowned teams were disbanded but were restructured when hostilities ended. The Philippine Amateur Football Association (now called Philippine Football Federation or PFF) was established over a hundred years ago in 1907. More teams joined the organization and produced world-class players, who were trained abroad. The most outstanding of the lot was Paulino Alcantara of the Bohemian Sporting Club, who eventually played in Europe. When the Americans took over the reins of government, they introduced basketball in the schools. Thus, during the Commonwealth period, football lost its prominence, exacerbated by lack of funding and support from the government. The unavailability of football pitches and facilities where players could practice dampened the enthusiasm for the sport. Although there were eight semiprofessional teams in Manila and parts of the Visayas and Mindanao, the country was without a national league for a long time. Thus, in 2005, the Philippines had the lowest record in the FIFA* International Ranking List. Last year, the team won second place the Asia Football Confederation Challenge Cup held in Maldives. The Azkals are keeping themselves busy in various international competitions, a slow and difficult path to their ultimate goal: the World Cup. 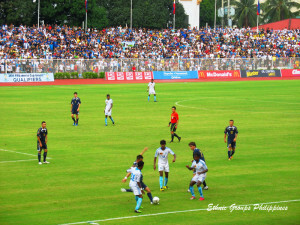 Many have criticized the Azkals for being children of Filipino-Foreigner unions. Nevertheless, these athletes are kicking up dust for the pride of the nation and, hopefully, to push the Philippines into the top 100 ranking worldwide. In addition, they want to inspire would-be football players to become future Paulino Alcantara, the Filipino who became member of the famous Barcelona Football Club. Since the resurgence of the sport, several grassroots programs have been launched to teach the youth football skills, as well as proper nutrition and values for them to succeed in the game — and in life. More than 50,000 children reportedly joined the PFF’s recruitment in 2014. A growing number of university students have also joined football leagues to compete in tournaments. Several international stars, such as David Beckham, Denise Wise, and Fabio Cannavaro, also came over to play friendly matches. At present, the Philippines occupies the 137th spot in the FIFA rankings and hopes to keep moving up in the years to come. Currently, the Azkals are competing in the preliminary qualification round for the 2018 World Cup in Russia and are bracketed with Bahrain, DPR Korea, Uzbekistan, and Yemen. After winning 2-1 over Bahrain and a draw against DPR Korea, they lost to Yemen. The FIFA World Cup is an international association football competition contested by the senior men’s national teams of its members. In the last four years, Philippine football has been transformed from a forgotten ballgame into a highly anticipated sport. There is no doubt Philippine teams can do much better if the players are given proper training and facilities. If the country does things right, prestigious competitions such as the FIFA World Cup will be within reach. It may take time and substantial funding, but nevertheless, the future looks bright for Philippine football.